The Legislature clarified the definition of “basic education” in a seminal bill in 2009. (HB 2261) That same year HB 2276 laid out an implementation schedule for some of the parts of 2261 that were clearly understood. The Supreme Court called out the two bills above as a good outline. To understand our obligations under this decision it’s useful to break the bills apart a little. Transportation of students who live outside a 1-mile radius of the school. Materials, supplies and other operating costs. (MSOC) We’ve done study after study on this and have a good handle on how much it is – this is stuff like textbooks, heat for the building, copier paper, etc. Second, improved instruction for very young children was called out in HB 2776 and very few districts are funding it today. All-day kindergarten. Many districts provide this for tuition, but charging tuition means that low-income kids who need it most can’t afford it. Reduced class size (to 17 per class) in kindergarten through third grade. Third, HB 2261 called for more rigorous graduation requirements and more instructional time to allow kids to achieve them. The Legislature has not adopted a schedule for paying for these yet, but they are clearly called for in HB 2261. Increase in instructional time for middle and high school students to 1080 hours from the 1000 we require today. This is another two weeks of school time that could be accommodated in many ways, and was added to the definition of basic education to allow enough time for a 6-period day in middle and high schools. Fourth, local taxpayers are paying salaries the state is supposed to be paying. (Quality Education Council Compensation Technical Working Group, 2012) The costs of employees in the model school definition are a state responsibility and the state should be covering reasonable costs for them. Forcing districts to pay for staff the state requires that they hire puts a burden on local taxpayers that’s unfair to districts without a substantial tax base of commercial property. It’s important to know that there is no proposal to increase salaries, just have the state pay instead of local taxpayers. There was some disagreement about the numbers in the report, with a minority proposal that left local taxpayers paying for state obligations for some compensation costs and that included only parts of the “Career and College Ready” item, but both reports agreed on the substantive core of the costs. The committee proposal here for 2013-15 is less than 2/5 of the eventual solution, but has a rational basis, which seems like a reasonable starting position. The problem of the regional differences in teacher salaries remains unresolved and will require significant work in the 2013 Legislative session. In conclusion, the total cost of funding our obligation to basic education will range from about $3.5 billion in the minority report to about $4.5 billion in the majority report. 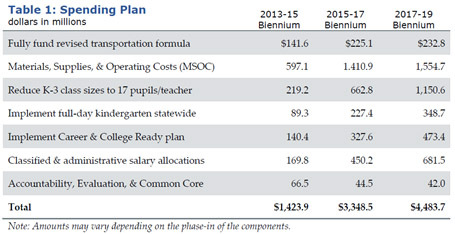 There are five school years remaining in the phase-in period, and consequently we should fund at least 2/5 of the increment in this two-year budget.